I know what you're thinking: Book fair is crazy-time. WHY would I want a longer book fair? 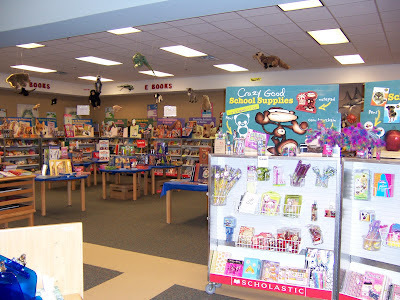 Well, for me, the most stressful thing about my book fairs (both elementary and middle school) is TIME. In a large school, getting every class in for both a preview and purchase time is incredibly difficult, especially when the last day tends to be shorter so you can take everything down and settle up financially. In a school of 800 students, if you schedule both a preview and purchasing time for each class, you are essentially trying to squeeze 80 classes into four days. That's 20 classes EACH DAY--no wonder we are tired! My current school has approximately 850 students enrolled. Three years ago, I just happened to receive my fair on the Tuesday before my fair was scheduled to start. Normally, I would have left the book fair sitting in a corner somewhere until setup on Thursday or Friday afternoon. When I received my book fair that Tuesday, I went ahead and started setting up. Since the book fair was announced for the following week, I took my time setting up, doing it over the course of a couple of days, between my regularly-scheduled classes. Students can preview as you set up. No, it won't be everything in the fair, but they'll still be excited about it. Students LOVE to help out! Get them involved by allowing them to move tables and chairs, set up table displays, tape down small items near the cash register (see #4 below), number and hang the posters, and put up book fair posters around school. There's no rush to set-up. I have all week. As I set-up, I get to really browse the fair, so I know what books we have and where they are located. I am almost always finished with set-up by Thursday or Friday, which gives my students extra time for browsing and sales. I don't have to come up with a lesson for my regularly-scheduled classes. The book fair browse/checkout IS their lesson. If nothing else, pop in the book fair video for them to watch. I liked the early set-up so much that I now request my fair be delivered "as early as possible," which is usually on the Monday or Tuesday prior to my scheduled week (giving me 2-3 extra days to spread out my classes). Next tip: Abolish preview day! I'll have to think about having more time this year, depending on if I am able to schedule classes at all this year. Our Sustained Silent Reading classes were dropped, so now I will have to schedule study halls to come for books. We'll see. Glad this worked for you! Wow. SSR dropped and barely any time for library? Let me guess--they did it to increase test scores? Do you ever have a book fair crew and do a lot of decorations for the fair?